Kung fu training at China kunyu mountain shaolin kung fu school,I am writing this with mixed feelings, part of me does not want to leave this place because it feels like home. Part of me realizes that I have to leave to begin the next chapter of my life, a chapter that I would not be able to commence with had I not come here! Having trained Wingchun for three years in England naturally I decided to learn Wingchun when I arrived here, I joined Master Guo’s class on my first day after arriving very late the night before. Master Guo and his students made me feel very welcome right away and Jenny the translator who was assigned to look after me and help me settle in did a good job. All the translators here work very hard to make new students feel welcome. I enjoyed Master Guo’s classes very much and I learned quickly that my body can do things that I had previously thought were impossible! Knowing that I would be returning to my Wingchun Club in the UK when I leave China I decided that I would like to experience a different martial arts so I chose to join Master Northern Mantis class, I spent the majority of my time in this class to learn mantis. I settled into Mantis quickly and really began to enjoy the teaching style of Master , he is very strict and pushes his students very hard to get the best out of them. My master has a great sense of humour and this being combined with a serious approach to kung fu training makes a fantastic atmosphere in the group. I knew nothing about Mantis before joining this group and I quickly found that it is a brilliant martial art, I was able to pick up some really practical self-defense applications, I hope to keep practicing them for the rest of my life.Kung fu training itself is very hard, it is for all of the disciplines taught here. Hard training is why I came here and I have not been disappointed with it, everyday has ended with tired, aching muscles and that is exactly how it should be.There is a lot of variety within kung fu training for all the groups, each day has a different type of training routine and I soon noticed that my body had become stronger, faster and fitter that it has ever been.I also attended Master Qu’s massage class on a Thursday evening, I found this class very interesting and I enjoyed it, I learned basic massage techniques for the back and legs, I also learned a bit about head massage and hot cups. My accommodation at the academy has been fine, the rooms are very spacious and have comfortable beds, desks and other furniture. The showering and washing facilities are also good, the academy also has an internet room and a shop that sells all the basic goods that I required during my time here. Master made sure that all of us had what we needed for our living quarters, such as extra blankets and spare light bulbs if they were needed. All the kung fu masters and translators make sure that we are all looked after. I received good help whenever I needed it and I am very grateful for that. Since I arrived a lot of improvements have been made to this place, most recently the big training hall has been fitted with wooden floor and central heating system, a new boiler has been fitted for the shower and bedroom radiators. My Shaolin kung fu school is surrounded by a national park and the training plan takes full advantages of it, I have enjoyed many tough kung fu training sessions on the mountain and I will miss it. At weekends when the weather is good it’s also a lovely place to walk, there is a lot of wildlife here if you take time to look for it. If this memo does appear on the academy’s website and you are sitting reading this and thinking about coming here to train, I would definitely recommend you stop thinking and start doing! My life here has changed me in so many ways, I have learned a lot about myself through my interaction with others. I have also been shown a whole host of new exercises and Kungfu applications that I will continue to practice.This place has been well worth to visit and I am so glad I came here. I feel now, almost like I have a different skin-in the same way that a lizard sheds its old skin for a shiny new one. For that I would like to say a big thank you to all the masters, translators, working staff and the friends I have made here. Thank for making this adventure a happy experience. My visit to China has been a life changing experience. I have learnt a lot about the Chinese culture and the people who living here. I have been made to feel welcome from the moment I arrived, everything I needed was catered for. When I arrived at the academy, there was a very well spoken translator to guide me around the facilities and make me feel at home and comfortable. For the duration of my stay, I studies Wing Chun and Baji with Master Guo, who is also a Tai Chi Master. All of the kung fu teachers at the academy are friendly, humble and have a lot of respects and love for the students. It’s been an overwhelming experience to study with true kung fu masters who have worked hard all there life dedicating their time to kung fu and it was a privilege to have this opportunity to learn what I have along side them. I’d like to say a special thanks to the translators and all the working staff for all the help and supports that has been provided for me , they work very hard to insure that the students are happy and comfortable. There are some great places to visit in Yantai. The academy offers taxis for the students so we have been able to get basic shopping and explore the city. Overall, the academy is a perfect place to meet superb people, live in comfort and learn amazing kung fu. My fitness and health is the best its ever been and I plan to continue all the good habits when I return to the UK. Thank you! I will be returning very soon. I’ve really enjoyed my time here, and I’m very upset to be leaving. Training under Master Wang has been fantastic. He’s totally devoted and dedicated to what he’s doing, giving his students 100% focus and attention. The passion he has for his work creates a great respect for him among his students. All of us want to work hard for him and earn his respect. He is very good at assessing each of his students individually, he works hard but fairly and pushes us each at our own level. He plans our training carefully so we are constantly learning and improving, and classes are always interesting. He creates a really enjoyable atmosphere in his class and I hope that it’s not the last time I train under him. I feel I have improved greatly in my time here under Master Wang’s training, and I thank him for all he has done for me. I’ve greatly enjoyed my time training at the Kunyu Shan Shaolin Academy, I feel the school’s students are very enthusiastic towards learning Kungfu and are quick to help other students, thus, creating a friendly environment making classes more fun and enjoyable. The masters are true experts who are highly skilled and knowledgeable. They are also great teachers. They have a very patient teaching style and ensure that the students fully understand the techniques being taught. The interpreters and working staff are also very helpful and quick to answer any questions and concerns the students might have. Generally speaking, I think highly of the school and hope to come back in the future. soon as possible and am heartbroken that four months have passed so quickly. I travel to China and started my journey a little over fifteen months ago now (it certainly doesn’t seem that long). Probably like most people arriving at the academy. I was nervous and didn’t know what to expect. The students, translators and masters were all very welcoming. The shaolin kung fu school itself was very large in terms of kung fu training, plenty of space both outside and inside the large training hall. The scenery including the mountains and lake were absolutely stunning, swimming in the lake after a hard day’ s kung fu training was very welcoming. The rooms were ample size for two persons with the usual furniture and fittings. The rooms themselves have had a major overhaul since I have been here. They are newly painted and new wooden dummy (very satisfied) In fact, there have been major changes since I have been here. New rooms, new showers, dining hall, just to mention a few. You can see that the money from the students is put back into academy. Kung fu training itself was first class. I learn Wing Chun, Baji, Qigong and Taichi from master Guo. He always had a smile and was very patient with students. Having trained a little with Master Qu (Mantis Master) He also had a very excellent character and was very patient. Since I have been here, I have not heard anything negative about the masters and working staff. Over the fifteen months I have been here, my martial arts and character have changed for the positive. It has not all been plain sailing. But sat here now reflecting on my time, the few complaints I have made seem very trivial now. 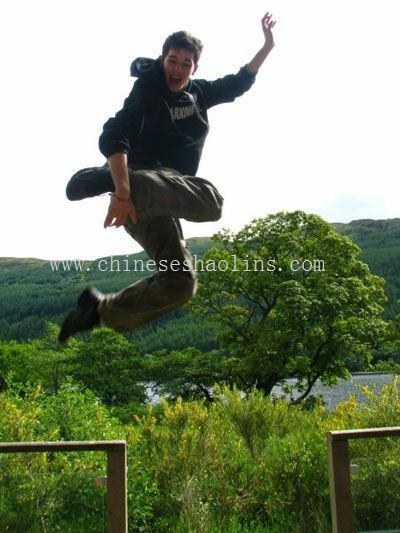 If you come here expecting really good kung fu training and accommodations, you will be very pleasantly surprised. Took part in the “2009 Mantis Fist Wine” Cup International Martial Arts Festival Opening Ceremony and received a gold medal in Sanda against a Russian competitor. I stayed at Kunyu Mountain for 10 months, but initially signed up for 3 months. The only reason I stayed as long as I did was because of the scientific training plan here and my great Master Guo. The academy has had many great improvements such as showers, washing rooms and cooks. The food used to be not very good especially for the vegetarians, however, now it has greatly been improved because of the new cooks. Money still has to be spent on basics such as windows and doors in the small training hall, but I have no doubt that this will be done before this winter sets in. Overall, I really have enjoyed my time although it takes some time to improve the standards. Fortunately, all the masters are always happy to listen to and help. I am a 40 something working mom with almost zero martial arts experience. I arrived with my 6 and 8-year-old sons for a one month "retreat" at the Kunyu Shan Shaolin Kung Fu Academy. The 4 weeks at the Academy were the most fun I have had in the past 3 years. Our "team" comprised students from Europe, Australia, North and South America, and Asia. Everyone looked out for each other, and the more experienced students tried to help the newcomers. Despite our varied backgrounds, we were all drawn to the Academy by a common dream- to learn Shaolin kung fu. I thought I was fairly fit, but I was not used to exercising 4-5 hours a day. The first week, I hurt everyday from my neck to the top of my feet. The next 3 weeks, I survived on acupuncture and ibuprofen! Master Wang was both drill sergeant and role model. His humility despite such skill was something I hope my sons will learn. He was always looking out for the boys. Beneath the strict demeanor was a kind and thoughtful soul. When it came time to leave, I wanted to pack him with us back to Singapore! The web page recommends running 2-3 km a day. I suggest double that. Try an adult gymnastics or yoga class at least 6 months ahead of time. Flexibility is paramount in kungfu. On our flight back to Singapore, my 6 year old said to me, "I want to go back to Yantai tomorrow to see Shifu (Master Wang)." I have purchased tickets to return in September. This was our 3rd trip in 2 years to “the Shan.” Stepping into the school compounds brought a familiar rush of peacefulness and calm. I had spent 9 months looking forward to escaping city life and all its stressors. People often ask me why I drag the boys to rural China for training. After all, the boys take regular kungfu lessons in Singapore. And why don’t you go to Beijing? There are lots of martial arts schools there. My explanation is that the Academy provides the most complete martial arts training short of a stint at the Shaolin Temple. In Singapore, the boys are taught similar forms and routines. But the emphasis is looking good on stage during a performance. Or winning medals in competition. At Kunyu Shan, they learn the practical side of kungfu. The applications (“see this move, this is how you use it to defend yourself.”) They see the other students hard at work after class. “Why are they still practicing, mom?” My reply, “because they love kungfu. They want to improve.” They are exposed to enthusiasm from the other students (very contagious). Most importantly, the boys see the Masters and watch how they treat people. None of the Masters are arrogant or boastful. Our Master exudes humility and kindness. This is perhaps the most important lesson in kungfu. A fellow student emailed me last year, “you didn’t get enough punishment the first time?! ?” I laughed. Training has not become any easier after 4 knee surgeries. Don’t tell the boys; I guess we’ll have to make a fourth trip. Wong Ting Yean with master and other students and her sons. purely on the martial arts, training effectively as professional athletes. incredible depth of knowledge and a world famous martial arts artist. My master, Master Guo, taught me again this year and his teaching was excellent. It was a pleasure to train here again, especially since the surrounding here is that beautiful. I hope to return here for a third time hopefully for a full year. May I take this opportunity of thanking all the staff at the academy for making my stady so enjoyable and productive. On particular I would like to thank Master Wong for being so patient and encouraging to me despite me having no experience with kung fu and not being a very able student. I very much appreciated Master’s Wong sence of humour. I would also like to thank personally, Frank, the translator, who met me on my first day, and has always been so helpful and conscientious, and who also has a great sence of humour. I hanve enjoyed the training and found it varied, intersting and effective. I particularily enjoyed the morning and evening sessions especially TaiChi. These hanve made me aware of things I did not know about. The food has been good , filling and nutritious-just right for training. The accomodation and training facilities have also been good. I don’t know how it chould be achieved but I appreciate it if all the students could come together regullarily and socialise in a more formal way. I was here for 4 months, my time here at Kunyu Mountain Shaolin Martial Arts Academy, has been enjoyable. Where the academy is located is ideal, up in a valley surrounded by fruit orchards and mountains. When I first arrived I thought the training would be more physicl, it is still hard the first few weeks, but after being here for a week or two I found I wanted to push it a bit more. which was fine because there are plenty other students doing extra training. The traning with my master was great. My group was small with some other experienced students that very helpful as well! I thought the training was well balenced with a focus on skills, basics, and technique, which for me was exactly what I needed. One I thought was missing was more discipline in conveying the right attitude and philosophy, and the process of learning Shaolin kung fu would have been good. I am leaving here, the fillest I have been in my life, and have thanks to all the stuff, translators, and most of all to Master Wong for his kindness and patience. I wish master all well in the future. 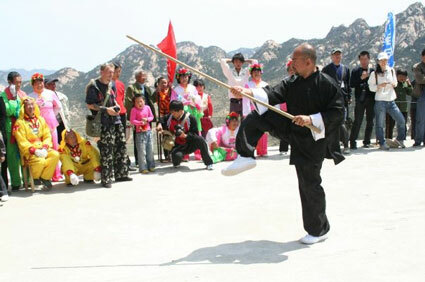 Learn kung fu at kunyu mountain shaolin martial arts school for a total of 10 months kung fu training under Wang Shifu. It has been one of the best times of my life and has opened my life to the world of Chinese shaolin kung fu. It has also been the best martial atrts training I have ever had. During my stay here, I have not only grown physically, but mentaly with a capacity not only to perform at a better standard, but to learn quicker also. All the improvements I have made is down to Wang Shifu.The Shifus put all their time and energy into kung fu training us and are extremely good at their jobs as well as being the best martial artists you have ever seen. Towards the end of my stay here, Wang shifu trained myself and a few other students for an international Sanda competition. It was less than a month which was very short notice for the fight, but Shifu works every morning at 5, and spent some late nights as well as weekends training us.We all ended up winning our fights, and we could have not done it without this time and expert trainning Wang shifu gave us. The kung fu academy is very comfortable with an absolutely amazing view of the mountains. The training facilities are good, and have actually got better during my stay. I have often felt guilty of my comfort here knowing that most other kung fu schools in China are not that comfortable. The food like the facilities is good, and has recently got better. The students who stay the winter are usually harder working and more serious than the students who are in the summer, some of with only stay for a few weeks which is not enough to learn anything seriousdly. All in all, I had a great time and have learnt priceless training and look forward to coming back in the future. We left Norway with one goal in mind: to find the true roots of martial arts. One year later we left Kunyu Mountain Shaolin Martial Arts Academy with stronger bodies, minds and a great deal more insight of Chinese culture, history, customs and way of life. The training is very varied since you study two styles that are quite distinct. While Wing Chun mainly focuses on the upper body, Baji will give your legs a proper workout with its low stances making up for Wing Chun’s high stances. Wing Chun and Baji is divided evenly out through the week, the class will usually start out with Wing Chun the first half and then Baji the second half. Apart from WC and Baji there is qigong, sanda and power training once a week. 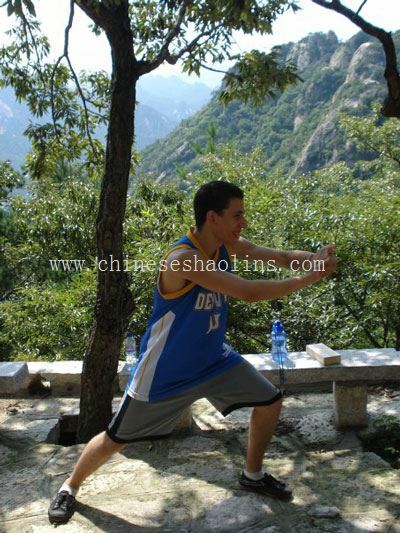 Guo, the current WC/Baji/Qigong/TaiChi master is simply amazing. With his relaxed and kind approach a stick is not required to make you want to work hard just to please this humble master which throughout our stay just continued to impress. Even when we were having a hard time with a new move he would not get angry, he would just calmly repeat the move in total perfection making us appear like re-animated zombies in our futile attempt at doing the same move with such grace only master Guo could do. Instead of physical punishment he would sometimes remind us of how weak our bodies were through telling a story about what he had to do under his master, or he would perform some physical feat grown men still dream about. Keep in mind that your stay at Kunyu Mountain Shaolin Martial Arts Academy will be greatly affected by the other people you’re staying with and the people you train with. It’s also important to sometimes remind yourself of why you came here. When we first arrived the facilities here at the school were not that great, for example the showers were outside in a separate house, the washing machines had seen better days and the food wasn’t all that creative. The rooms had no proper flooring and the baths were quite old and moldy. But things have improved a lot since we came. The baths/washing rooms have been rebuilt with a couple of shower cubicles and proper sinks. The old washing machines are replaced with newer models and your room now has nice wooden tiles. They even had the concrete stairs tiled with marble tiles! Apart from a room with a wooden bench, desk and bed the school also provides some weightlifting equipment, basketball court and a ping pong table. All the different groups practice Qigong while TaiChi and XingYi can be trained in the morning and afternoon classes along with Qigong. But the masters are very flexible so you can cross classes if you want to learn something else. Being here a year,I have seen the academy change a lot.Headmaster have put a lot of effort in to improving the traning facilities and living environment for the students.I have also see a big improvement in the food and health care for the students. For my year,I have studied in master Guo’s class.Master Guo is a master in Wingchun,Baji and Qigong.He’s knowledge in both the forms and applications make learning from him a priviledge. All in all the spending a year here,I feel like we have all become a big family.The translators and working staff are amzoly fun and easy going and will help you out whenever you need.I will miss this place a lot.It’s like a second home.I hope that soon I will be able to come back to see everyone and to see how much the academy have improved. I studied Wingchun and Baji for one year under the guidance of master Guo.Master Guo was an exellent master,very patient with all his students including myself.Master Guo is very experienced in many forms of martial arts which is evident in his teachings. I feel that one year was a very good amount of time to stay.I learnt a lot in the course of my training.I feel that during my time at the academy,I have improved myself both mentally and physically.The academy is a great place to study martial arts and to make lots of great friends.By the end of my stay,my group felt like part of my family and they will always be my Wingchun brothers ans sisters. I know I will miss being at the academy and I will miss everyone there.Master Guo,the translators,the students and even Mr Tong.I really enjoyed my time here and hope to come back someday to learn more about martial arts. Kunyu Mountain Shaolin Martial Arts Academy is a great environment for people to escape their normal routine and learn kung fu.I have enjoyed my stay as much as not just training but the entire life style is very fullfilling. There is a lot of varied training which will push you mentally and physically.The company and style of living is that of a boarding school and I have enjoyed the sense of community and friendship this brings.It is in a scevean location,mountains,rivers,lakes for swimming.When exhausted after training,it is perfect for the simplest thing,just reading a book,as this place is a very pesceful setting. The food is good quality and nutricious.It’s standard has improved greatly even in my time here. 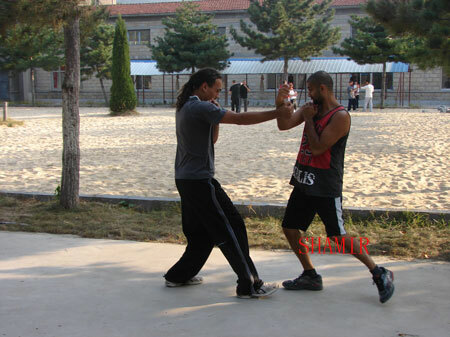 In two months I felt I have learnt a lot and became proficient at basic shaolin kung fu.I have enjoy my stay greatly. I have stayed at the Shan for a year and can safely say I have enjoyed my time here and have learnt a good amount of kung fu. I have trained 5 days a week with some amazing masters.My master,master wang has been a fantastic master who has greatly helped me improve over the year.I now consider master wang as not only a master but as a good friend who I will keep in touch with.If you have the chance of meeting him,then I recommend that you find out about his life and his teaching in both Shaolin external and internal. The accomdation at the shan is quite nice.Do not expect anything special,but you can still get a good night sleep after training.The food has got a lot better over the year.They have also built new indoor showers,which are great！Other things like toilets are all fine.You just have to get used to them. The main reason for coming here is the TRAINING..As long as you train hard with the masterd and the training equipment given and you will surely enjoy yourself. Good luck to anyone that comes here.Hope you train hard and make some friends on the way. P.S If you meet my master wang shifu,then be sure to find out more about his teaching in shaolin and Sanda,both external and internal! It won’t dissappoint. When I think of the 4 months that I spent here at the academy,I can think of only nice memories.I enjoyed training from the first day I arrived at and from then on it got more and more interesting each day as I learn new things and felt myself improved and gain more flexiblility and strength.During the first week I was very impressed by the Qigong class,because I loved the peaceful atmosphere of meditating in the middle of the mountains.But I enjoyed forms,sanda,power training and takedowns just as much as I had to pick which class I liked the most I would not be able to choose only one.Most of the days I felt exhausted,but was already looking forward to the next day.I also loved that these were always new things to discover,such as going to the national park for training or bear-crowling down the temple steps or going for a swim in the lake after class.I am also glad to have been here during several festival days,which include a celebration at the temple and a walk to the top of the highest mountain here. During my stay I trained with master wang and I could not ask for a better master.I have enjoyed everyday training just as much as his classes on Buddhism theory.I believe that he has taught me a lot during my stay here and I will miss being part of his wonderful training group. Overall staying at the academy has without doubt been one of the greatest experiences of my life.I Love the peaceful atmosphere of the academy and being away from big cities and western life for a while.All the students are very friendly and it was wonderful to meet people from so many different countries.During my whole stay I never felt lonely and often forgot entirely how far away I was from my home country. At first I want to say that I really enjoyed the training and that I’m happy to practise with masters of such a high level. I also liked the composition of the disciplines.Still I would have enjoyed to spend more time on practising basics, especially stances. As I talked to some other people, I know that some of the Wing Chun and other Shaolin students think the same way. All the Shifus and translators are really nice and helpful, what makes it a pleasure to stay here. The quality of the food now is much better than when I first got here. Lately there have been some really tasty dishes. For the vegetarian table it is important to get at least two dishes of cooked vegetables and one plate with raw fruit or vegetables. I also think for a healthy diet. It would be sustentative to get more diverse carbohydrades. It would be nice if the kitchen could serve some other grains .Maybe barley or sorghum, but I’m sure you know better what kinds of corn are available here.Also lentils and some kind of beans (lately we had some ) would be supporting, especially for a healthy vegetarian diet. Another point is the website. Although the structure isn’t very good, it is informative and in a lot of points it gives a good image of the school life. But still there are two major issues in which a future student expects something different than she or he will encounter at the academy.One thing is that the website suggests that the school is settled in a much more remote place where it is possible to reatreat and enjoy tranquility. I think especially long-term students, who decide to spent a year (or more) of their life here, should know what kind of environment will expect them. The other thing is that I request a more accurate description of the internal Martial Arts Styles. My name is Julian Braithwaite, 24 years old from London, United Kingdom. I had the honour of training under Master Wong for five months in 2009. 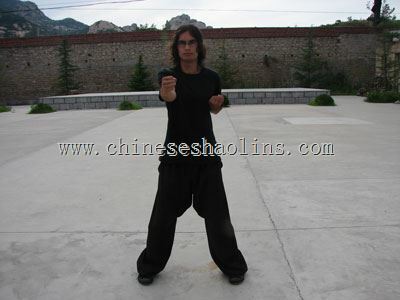 During this time I received a high standard of training in Shaolin Kung Fu, Sanda, and Chikung. Master Wong radiates great professionalism and teaching experiences, and could answer in detail any query I had throughout my training. 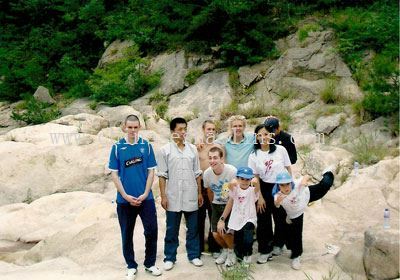 He was able to adapt to the needs of each student in the group, as we all had vastly differing martial arts experience and abilities. Master Wong demonstrated patience and understanding, and was always approachable if needed, even outside of training time. It is clear that Master Wong high understanding and success in the field of martial arts, despite his relatively young age, is of huge benefit to his students, which is passed on through his teaching methods. This creates an atmosphere where each of us strive to train harder and learn more with each day, resulting in our class always being the last group to finish. As a result of my time under Master Wong I have found that I have increased in strength, fitness and flexibility far more than I could have hoped in such a short time. I have become much more confident in sparring and applications, and also feel I have a much greater understanding of Shaolin Kung Fu, both in the physical and mental aspects. My only regret is that I was unable to stay longer. In conclusion, I feel incredibly fortunate to have studied under such an experienced and skilled instructor, and as a result I have found my stay in China to have been an experience I will never forget. I would highly recommend Master Wong to anyone interested in Shaolin or Sanda. It was snowing and cold. I was taken aback by the ice-covered granite mountains that encircle the academy.When I walked in I was met by the smiles of the masters and was led to my very basic room. Training immediately started. I wanted to try out some styles as I was not sure which one to choose.I started in mantis, which is regional to Shandong. I liked the style and decided to stay. Cho Sifu, my master, comes from a very prestigious lineage of martial arts, his style being Taichi Meihua Praying Mantis.He is a very dedicated man, someone who embodied martial arts from a young age, and developed phenomenal skills and knowledge of fighting. He is a very strict teacher with high standards. Also a very caring teacher who came with students to the hospital when the get injured. Cho Sifu, also a doctor, helped me through my injury and to become a better martial artist. He has a profound depth of knowledge and wisdom, that I will always remember. Over the last sixth months I have learnt mantis forms, also very effective applications. Also Cho Sifu teaches Bagua which I want to carry on in England, which is a very interesting complete system of fighting based on circular motions. I have enjoyed my time at the academy which is a great place for someone to come and get fit, learn to protect themselves. It’s not for the faint hearted. It is a daily challenge which is not for everyone. The academy on a whole is great. It is made by the master who are superb. The area of kunyu Mountain is perfect. The moutains make you feel isolated from everywhere else. The school’s accomodations were satidfactory. It’s not a 4 star Hotel, but you can survive on it, a few things extra that can be given would probably be free toilet paper and fruit. The training at the school is amazing. I can’t speak for the shaolin or wing chun, but the mantis training is exactly what I wanted. I have learned so much from master Qu, both in martial arts and life in general. My favorite parts of the training were the applications and mantis sparring. I had grerat time training with my group and master, especially when we trained out in the park or the temple. Probably the only reason I am willing to come back is to be trained by master Qu again. All in all, after the school is done with constructions and gets new training equipment, it will be a nice place to learn martial arts. This is my second time to learn kung fu in China kunyu mountain shaolin kung fu academy in April,2010,I will stay for another two months. 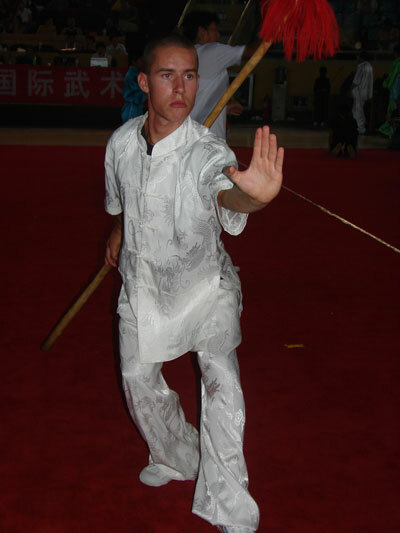 I travel to China and study kung fu in China kunyu mountain shaolin kung fu academy,as a long term student who has stayed for duration of a year,I can easily say that I have learnt a proficient amount of Kung Fu. Kung fu training 5 days a week with what consider to be some of the best shaolin kung fu trainers I've ever met. I have trained with 2 of the shaolin masters who came from the shaolin temple and have learnt the training technique used in shaolin temple My main master throughout the year was Shixinglong. He has been nothing but an excellent master who has helped me tremendously and has become a master and very good friend for life. I would say that a year long stay is a good amount of time to get a good understanding of the foundations of shaolin kung fu. If you stay here and work diligently, you will leave with many fist forms, knowledge of some shaolin kung fu theories and a good understanding of how to train back home. You should come here with the intention of kung fu training and getting some kungfu training for exceeding the standards of western kung fu. Do not come here looking for a holiday camp with 5 star hotel. This is no hotel but I have felt comfortable living here for a year. The all the staff are friendly and helpful. If you come here for with the mind set to train kung fu hard then you won’t be disapointed. I hope this helps you in search to find a Shaolin kung fu academy in china. During one year stay here, karl Kingscote participated in two competitions, and both got the first place.